It’s time again to highlight another great venue in the Charlotte area! 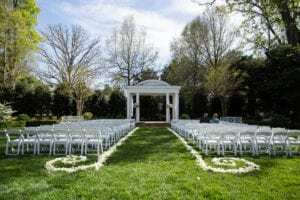 Here at Magnificent Moments Weddings, we love nothing more than sharing these great venues and the people who work at these locations with you, our clients. This week’s spotlight is on The Duke Mansion and the many features it has to offer! Located just outside of uptown Charlotte, this home is truly a wonder to be seen. 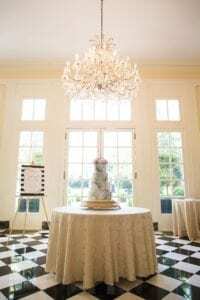 The lush grounds and magnificent garden rooms of The Duke Mansion create an enchanting setting for an outdoor wedding ceremony filled with all the grace and beauty you’d expect in such a historic location. Sound pretty amazing? We haven’t even mentioned the amazing event staff of The Duke Mansion who settle for nothing less than perfection. We love the staff so much, we thought it would be great to introduce them to you! So we sat down with Laura Stump, Social Catering Sales Manager, who gave us all the details on this great location. Our wedding number is capped. We only host 25 weddings per year and generally sell out about a year to a year and a half in advance. I love it when couples incorporate bold colors into their designs. 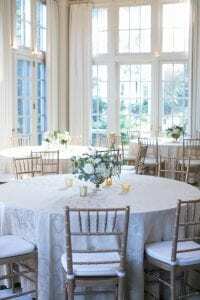 This house lends itself really well to an “ivory and greenery” type wedding so we see them quite frequently, but it’s so exciting and fun we have brides that aren’t afraid of color. Adding in a bright pop in your florals or accent linens is great! We have seen couples bring in custom bar fronts with floral designs that match their invitation suites or hanging some unique and modern chandeliers in your tent is both functional and fun. I love this industry because there is never a dull moment. I love getting interact with people all day. We get to help families celebrate the most exciting day of their lives and I feel so honored that they let our team be a part of it. I also love the vendors that we work with. We all form genuine friendships and bonds and it’s always fun getting to see everything at networking events, parties or working side-by-side on a wedding day. My best piece of advice to newly engaged couples is to hire a wedding planner! Whether you have a lower budget or are spending a fortune, finding the right planner to meet your needs and style will go a long way to ensure your day is as perfect and stress-free as possible. I always liken it to doing home repairs. If my roof needs to be repaired I am going to hire a professional roofing contractor…not climb up there and do it myself. It’s the same for a wedding day. You are spending so much time, money and effort. Why leave it up to chance and your inexperience? Hire a professional that can handle all the curve balls! Need more great tips on all things wedding in the Charlotte area! Contact Magnificent Moments Weddings, we would love to share our experiences with you and help make your wedding dreams come true! And go check out a few of our Duke Mansion couples – Lauren and Andreas and Sarah and John!